The Green Talents Award, held under the patronage of the German Research Minister Prof. Johanna Wanka, is providing a platform for the seventh time to young talents to share their views on green concepts and to make our world a better place. A high-ranking jury of experts selected 27 up-and-coming scientists out of more than 550 applications from over 90 countries. Their prize is one of the treasured tickets to the “Green Talents - International Forum for High Potentials in Sustainable Development”. This year's “Green Talents” can expect two weeks of interaction with leading experts and some of the most renowned research institutions and companies, including Fraunhofer Fokus, KWB - Berlin Centre of Competence for Water, Ecologic Institute, Henkel and ThyssenKrupp Steel Europe. Getting connected to the science community and exchanging ideas with its key innovators allows the winners to lay the foundation for future cooperation. Such efforts are supported by the invitation to return to Germany for a fully funded research stay at an institution of their choice in 2016. The 27 Green Talents will be honoured during a festive awards ceremony attended by representatives of participating institutions, jury members, and other distinguished guests. The awards ceremony will be held on 30 October 2015 at the Federal Ministry in Berlin. 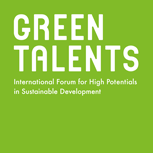 Become part of the Green Talents Science Forum 2015 and follow the posts published on www.greentalents.de, LinkedIn or Twitter! Please find the profiles of all 27 awardees here.